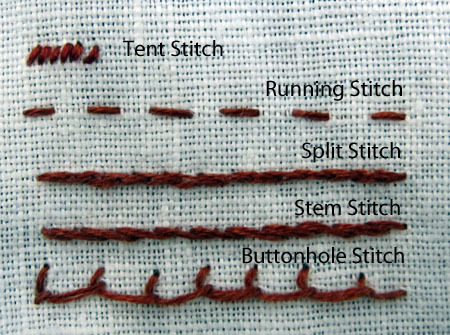 Purpose: In this class you will learn some very simple stitches: tent, split, stem, running and buttonhole. First, I’m going to teach you how to do all five stitches. Then, you’re going to start working on your project which incorporates four of the five stitches. You won’t finish the project in class, but you will know enough by the end of the class that you can finish the project on your own. The project will be a small bag made from two pieces of embroidered linen sewn together on the sides and the bottom. Needle – In your kit you will find two needles: a large needle for the plastic canvas and a small needle for the linen. In any project, you need to choose the right needle for the project. A needle threader is also good to have on hand. Thread- Period threads are silk and wool. However, DMC cotton works just fine if you’re not putting a piece into competition and you want to save money on materials. There are also metal threads, which are outside the scope of this course. Please note that many colored threads will bleed if you get them wet. If you are stitching on something that you intend to wash, you might want to wash the threads in warm soapy water first. (Note: I never have because I don’t wash my embroidery.) The dyes are not as stable as they once were because the use of heavy metal (poisonous) mordents has been outlawed. Cloth – Period cloth is wool and linen. Today we are using linen. I recommend pre-shrinking first, which I always do. Hoops/Slate Frames – Using a slate frame is a period way of doing embroidery. Also using no frame or hoop is period. However, you can save those methods for when you are more advanced. Today we’re using small plastic hoops which you can take home with you. You can see that this stitch is “one-over-one” meaning that it’s over one thread of the fabric. You should try to acquire even-weave linen for your tent stitch projects. The example on the right is a sweet bag in progress. It is a late-Elizabethan/early Jacobean textile. While tent stitch is easy to do, technically speaking, the practicality of working at such a small scale makes these types of projects a little more difficult. This project was worked under magnification. Now that tent stitch has been demystified, let’s move on to the stitches that we’ll be working with in class today. 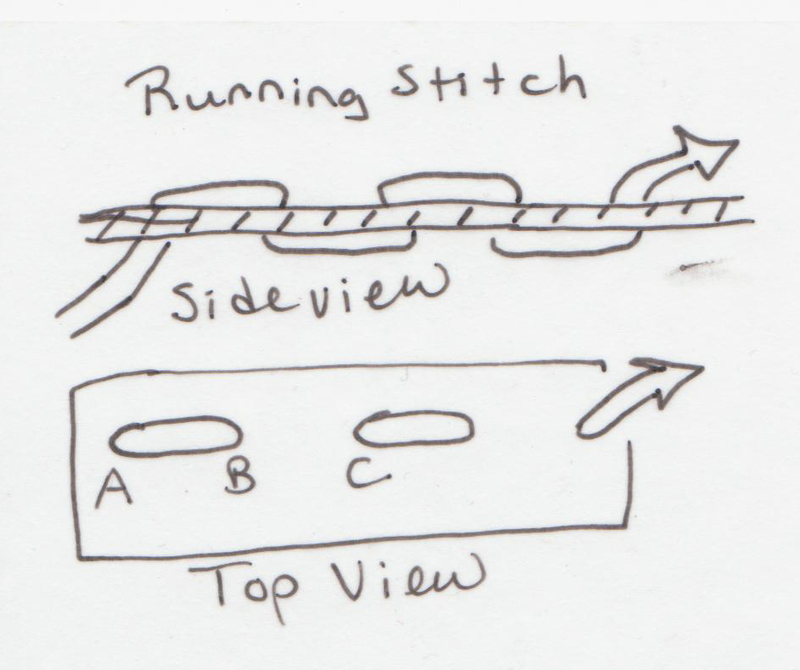 Running stitch is a decorative stitch and also a construction stitch. 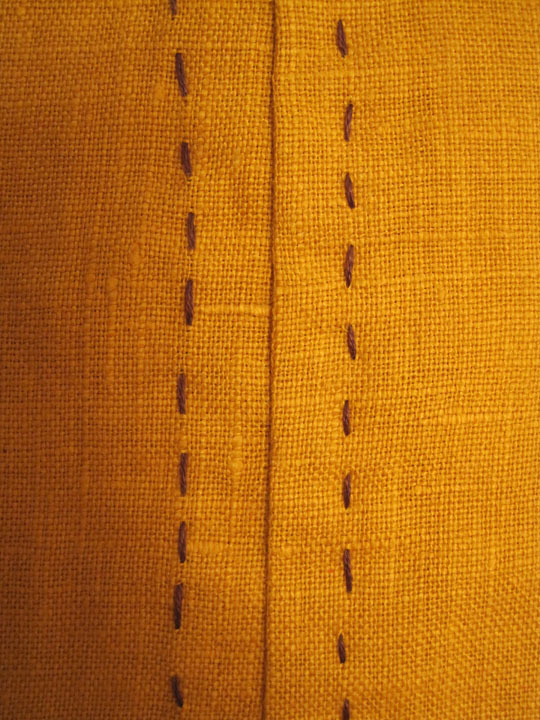 The image shows now it is used as a decorative stitch on a Viking apron. The leaf on the left shows the running stitch used on a work bag. The inspiration for this piece is an English work bag currently on display in the DeWitt Wallace Museum in Williamsburg. 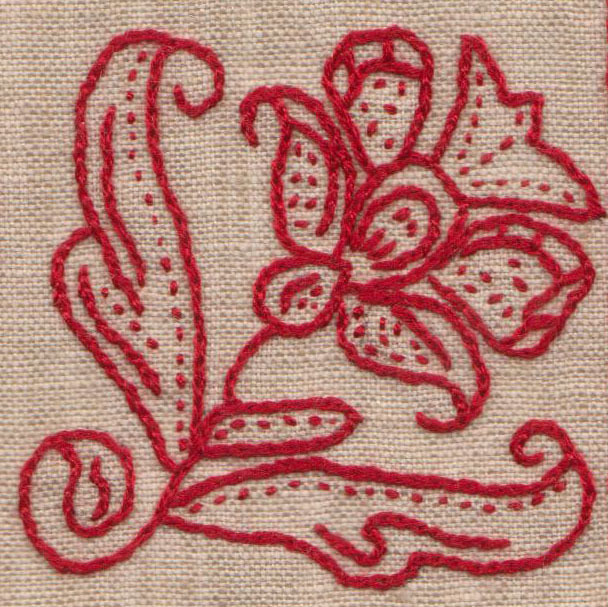 You can also see running stitches on the black flower shown on the next page. I like split stitch. It is as described: a stitch that is split. It is the stitch over which I have the most control. I also have the most fun with it. 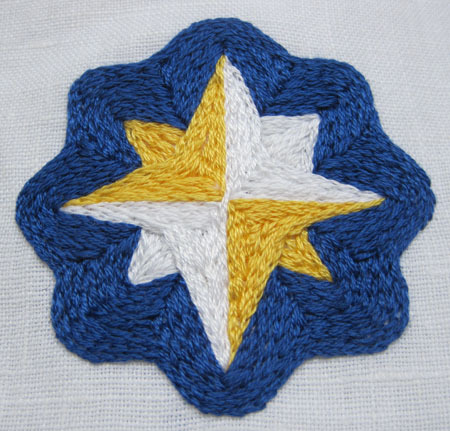 It can be used as an outline stitch as shown with the bee and the rose, and also as a fill stitch as shown in the populace badge for the Barony of Highland Foorde. The split stitch looks a lot like the chain stitch, but it is easier to produce. The important thing to remember about the split stitch is to come up from below and pierce the stitch above. Stem stitch is a work horse stitch. It is described as an outline stitch. Many items are made with a stem stitch including entire curtains. Buttonhole stitch (also known as a blanket stitch) is used as a decorative stitch as well as a stitch to make buttonholes for drawstrings on your bag. 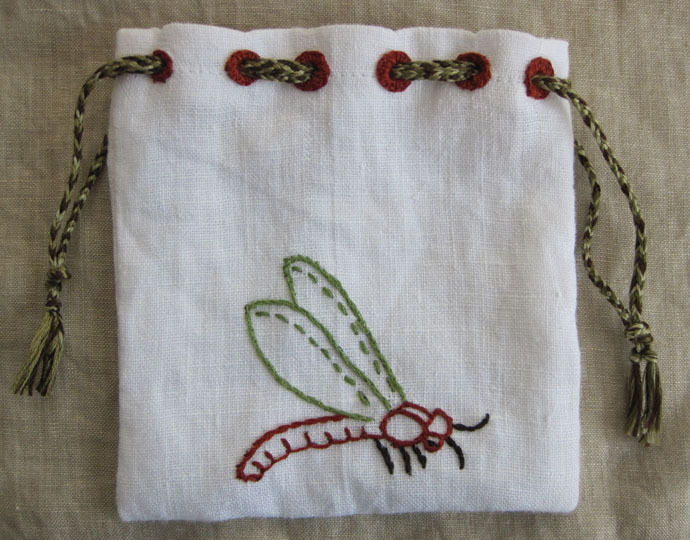 The class project below is a dragonfly based on an embroidery found in the Burrell Collection in Scotland. Each stitch is shown in a different color so you know what stitches to use. You have been given more thread than you will need to complete the project. Each embroidery thread is 3 strands of DMC, 20″ long. I would recommend this short length so that your threads do not become tangled. For your class project, you have been provided two pieces of linen to sew into a small bag. 2. Sew the bag together on three sides. 3. Turn the top edge down and sew in place. 4. Create an even number of buttonholes around the top of the bag (6 on the front, 6 on the back). 5. Thread the drawstring through the bag. Remember to make your buttonholes big enough for the drawstring! Have fun! Gerald of Ipsley and Robert of Oldcastle. Celtic Embroidery. http://www.malverack.com, email robert@malverack.com. Self-published, no ISBN. No publication date. Purchased circa 2004. Gerald of Ipsley and Robert of Oldcastle. Celtic Design, Pattern and Color. http://www.malverack.com, email robert@malverack.com. Self-published, no ISBN. No publication date. Purchased circa 2004. Mayer, Krystyna. Editor. Mary Thomas’s Dictionary of Embroidery Stitches. Trafalgar Square Publishing, 2005. Thursfield, Sarah. Medieval Tailor’s Assistant: Making Common Garments 1200-1500. Costume & Fashion Press, October 2001.